Before people Blast me for not cranking up the boost. I'm done breaking transmissions....and so I've asked Abel to bring power and Tq down. This lets me drive the car harder and worry about the next clipping point or following a driver rather than worrying about slipping the clutch extra every time I shift. Response is beautiful and easily the best I've ever felt on an FD. Andy Wyatt came and set up the new ECU himself. And Abel Ibarra took over the Full Boost Maps!! car drives like a dream.. even at the slightest bit of throttle. No issues driving at 1400RPM..and I'll try and get some video of it asap. Beautiful machine you have there. What set up you had before and how better is this set up for you, if you feel it's better? Congrats on the set up good power for 17psi. 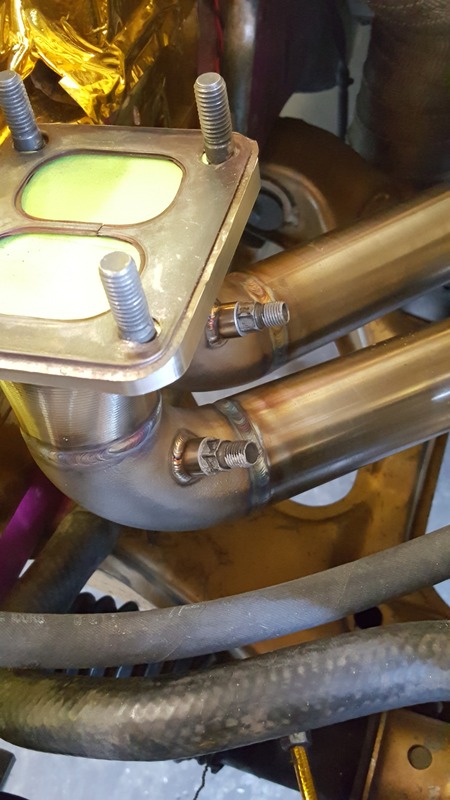 Can you talk a little more about your exhaust backpressure measurement? Where is that located for measurement. Are the actual values it in your datalogs? It's nice seeing solid believable numbers posted! Looks like a great setup and it's good to see your comments about drivability and not peak numbers. Thanks much!! I was using the EFR 8374 before with this same set up. Unfortunately although we made more power 512/420 tq... we were at 20psi and weren't measuring back pressure. We also had 4 pin holes in the lower intake manifold and a small turbo gasket leak. It might not have affected much...because it was fast. But we limited rev limit to 8k because we were running out of injector with the 1300's. The 8374 DOES suit my needs better and I'll be going back to it. But if you have a powerful enough ecu...the semi-p can still be very driveable even at 1400rpm. But don't ever expect it to drive like a street ported engine below that. Yezzir!! I actually had answered this with pictures of my manifold..but I guess I forgot to hit post and then closed out of chrome before checking. Seems like a staggering amount of work for 450hp. Any reason you went for a high revving setup like the crossport if you're drifting and don't want to kill transmissions? Well for me... it's about developing the largest powerband possible. I'm not concerned about the number 450 hp. And truthfully....I could care less what that means on paper because 99% of the time it tells no other story. For instance.. people saying their car makes 600+hp. 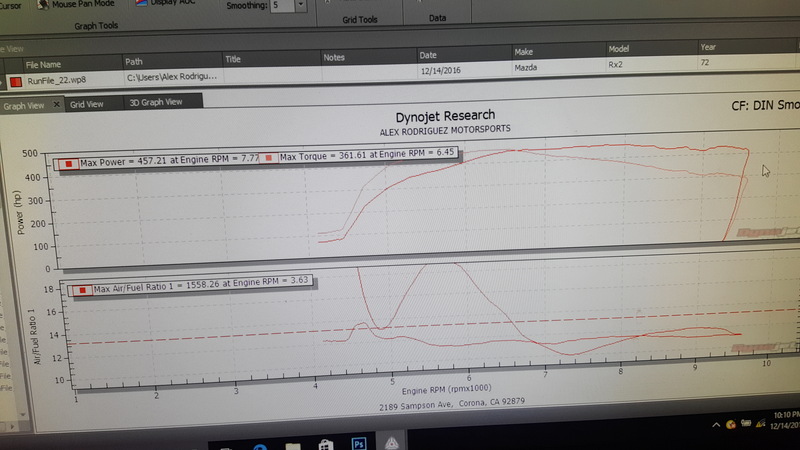 Most of the time people mess with the dyno numbers. And then the graph looks like a peaky mountain, jagged and all over the place. A powerband like that is virtually worthless for any type of track car. It might be ok on the freeway. But for any spirited driving... no fun ya know? The sooner the engine is able to get to the desired Boost level...and Hold that Boost level all the way to redline.. the better. By carrying more Revs.. It makes the car more driveable in drift. although Tq does drop off to an extent... think of it as a "Buffer Area," of sorts. There's a balance between wheel spin and grip. Too much grip and the car straightens out....too much wheel spin...and the car slows down and in drift... you're more likely to spin because side bite disappears. But when you push the clutch in.. RPM falls.. by the time I am able to Blip the throttle...and slip the clutch back into gear.. 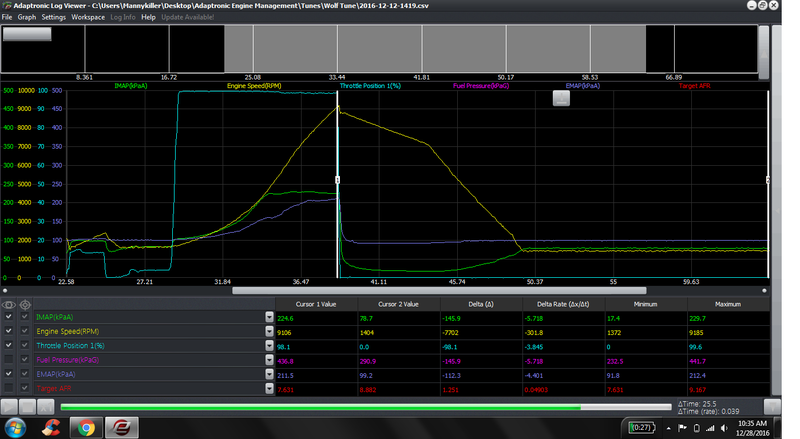 EVEN if I left the power band at 8K....the RPM's will have fallen to 3-4K by the time I'm back on throttle. By raising rev limit.. it allows me to raise that level from 3-4k to 4-5K...As long as I drive the same way. Which is blipping the throttle while lifting clutch. Sorry if that isn't as organized as I'd hoped..but I hope that does explain some. 9174 comes on slightly later...slightly slower spooling due to larger inducer, I don't look at power up top because I don't and shouldn't drive on the limiter. Driveable powerband is from 4000 to 9600. giving me roughly 5K to work with or Operate within. 8374 comes on quicker....3500 rpm... rev's quicker due to smaller inducer, doesn't produce the flow up top...but I don't need it to.. I just need it to punch hard when it comes back online.. Driveable power band is from 3400 to 9600. Giving me 6200RPM to work with or operate within... Making the car car More driveable. Also..to answer your question.. It's the Shaft that our gears sit on that bend under load. Tq is what's doing it.. and out of the last few.... the transmissions all have let go at the same scenario.. 4k ish Rpm in 3rd gear... Lower Wheel speed.... meaning a very hefty load for 3rd gear. Although I'm still trying to figure out one of the failures. It was before the semi Pp. I was at 7800ISH rpm in 2nd gear... Initiated... and hadn't even fully released the clutch..and BAM!!! It was the loudest noise to date. Chunks of metal filled the trans pan. 1st gear was the only thing that worked.. and it was impossible to get in and out of it after it went in. It was stuck. 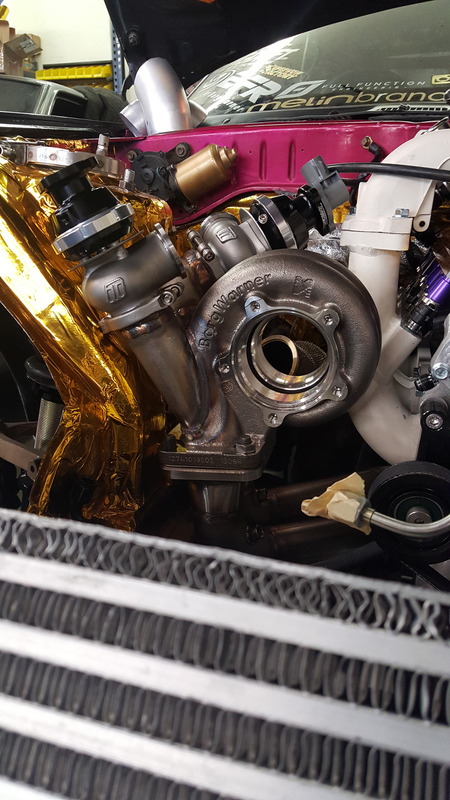 Thats so cool what you've done with the wastegates off the t-housing. Is there a performance benefit to that or just packaging? soo what do you think of the idea of semi pp with efr 7670's spooled sequential. 3k rpm to 9600.. if i build a motor to go that high, probably 8.5k limit on current engine. Last edited by lastphaseofthis; 12-28-16 at 06:39 PM. I would like to know who did the weld job! I wouldn't necessarily call it popular. Done before..absolutely. There are tricks. There's a reason I did it where I did on the housing. There's ton's of debate about priority etc.. but at the same time.. Everything in moderation. Too little..and you over boost..too much and you're losing spool and compressing springs and compromising diaphragms. People may argue against me...but I wouldn't ever put the gate where the above video did on the housing. i'm also not a fan of sharing a single gate per divided runners. Will it work? yes..but it's not better. To me...and from what i've learned....you really don't want to create more turbulence than you have to. But it's all based off of theory in the whole exhaust gas Expansion debate. I believe in long runners. I think it allows for more efficient Burning of fuel...and exhaust gas expansion before it hits the turbo. The other theory is to have the turbo as close to the exhaust ports out of the housings as possible to take advantage of the Heat/Energy. But going along with what I believe...if you gate your exhaust pressure right out of the rotor housings... your dumping un-burned fuel and wasting energy. If you put the gates at the furthest along option (in my set up....it's the turbine housing) you vent that same exhaust gas pressure after it's had time to expand. And I've had first hand experience with both set up's. I still think the expansion theory is better. But anyways... Hope that sheds a little light as to why I did it. Plus...gates out of the hood are always cool! This is the first set up welding gates to the turbine housing... but the third set up with gates out of the hood!! The video makes a lot more sense when you know a bit about Sloppy Mechanics. There is a reason they went with that name lol. I don't want to detract from all the cool and useful info in this thread but nice job! Very cool build, please keep the rotary drifting scene alive! Keep up the good work! that engine bay..! I love the 2 waste gate set up.. I see that you are looking for the best usable power.. excellent and good numbers too. I thought about Liberty..but I'd still question the box's other components. Although its' a shaft upgrade...from memory thats just the input shaft correct? So I always weigh the price of the service...vs a whole new purpose built box ya know? or a box that is capable of the purpose Any experience with the Liberty upgrades? Thanks much!! Appreciate the encouragement!! Impressed by the difference between IMAP and EMAP especially at 4500rpm ! Can't make sense of the units though 212Kpa max. EMAP=31psi ? Last edited by mannykiller; 12-31-16 at 05:19 PM. Just for the sake of argument, the unburnt fuel idea seems null since if the wastegates are open you're already spooled? 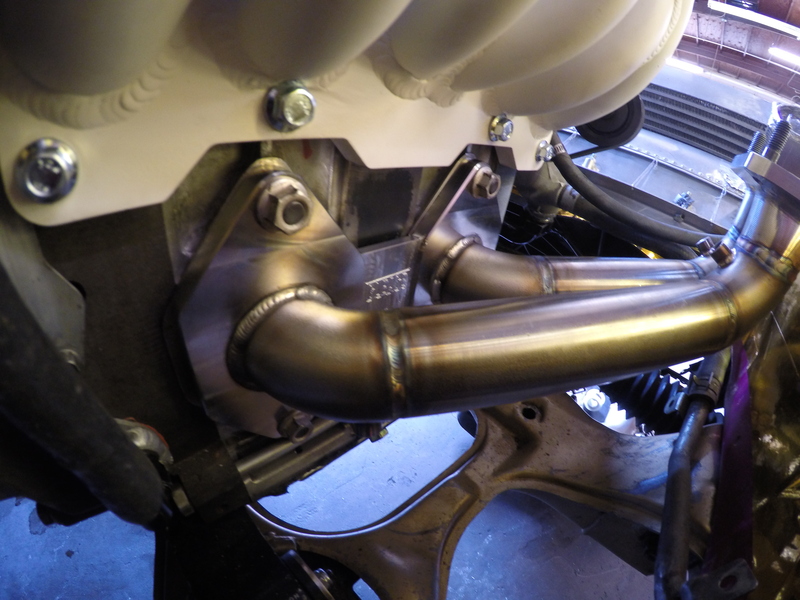 Who cares though, bonnet wastegates are **** and what you've got seems the most simple and elegant way. emap at 31 psi absolute is still only 16 psi at 17 lbs of boost! at 9k! dang.